Hi, I have a question actually. Do you know which age range was it use for? I am researching for a film, and a kid in our story will have to wear one WWII gas mask. HE is eleven, and I was wondering if these were made only for a smaller child. 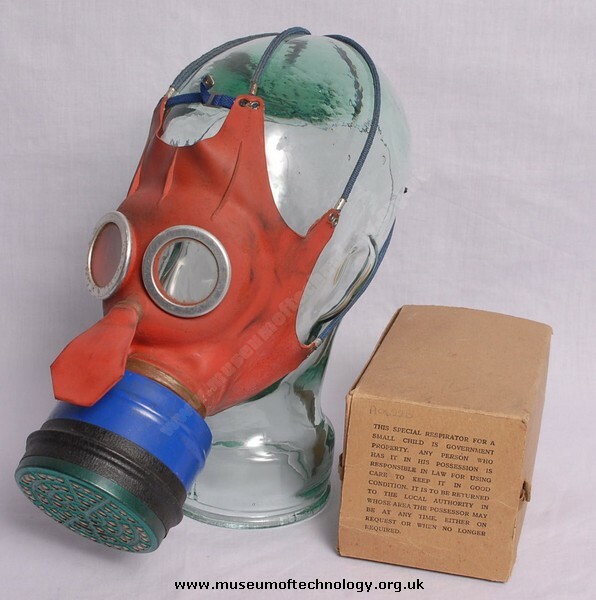 Born September 1937, I was terrified of this, my bright red gas mask. Many years later, I discovered that when my own son was around the same age as I was then, that he also was very upset when he saw red rubber household gloves. I now believe, at 74 years, that red was a very silly colour to use for a little child's gas mask. Thank God the mask was never used for real. My Dad destroyed all, when he left the army in 1945. I still have my mask in its cardboard box in excellent condition. way I had my mask on at the time.